Ten years and 260 girls later, we look back at the impact of SciGirls, a unique, hands-on summer camp for girls who dig science, by talking to two former campers. SciGirl Stephanie Reynolds at the camp in 2007. Stephanie Reynolds today. She begins a PhD in in chemical engineering the fall of 2015. 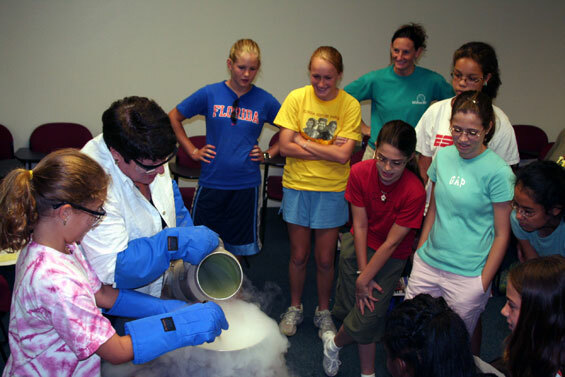 SciGirl Lucy Toman (in yellow T-shirt) watches a demonstration on how to make ice cream using liquid nitrogen at camp in 2007. 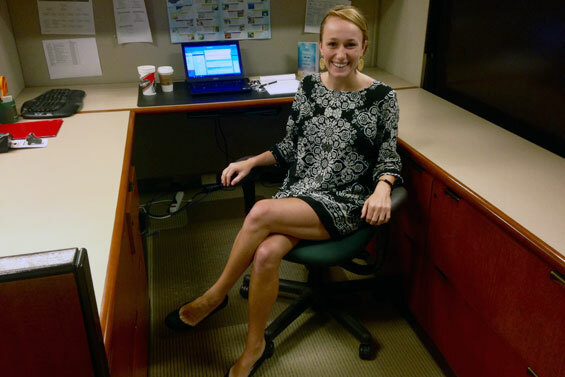 Lucy Toman today, at her summer internship at the Society of Women Engineers. 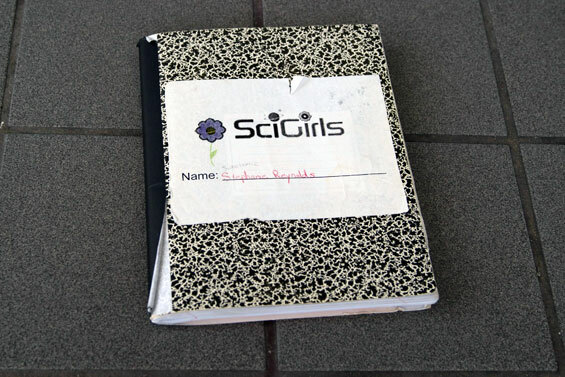 Stephanie Reynolds' SciGirls notebook from 2007. Ten years ago this month, 16 middle and high school girls spent a week at a brand new, hands-on science camp. Operated by the National MagLab and WFSU, the SciGirls Camp offered a mix of outdoor field experiences, indoor labs and interactions with scientists. By exposing the girls to a wide range of science disciplines in a fun, positive environment, camp organizers showed them the value of science in their lives and a glimpse of the exciting careers they could one day pursue. After an amazing inaugural year, eight more summers of SciGirls camps followed. This month, SciGirls celebrates a decade of getting girls psyched about science. Including the class of 2015, a total of 260 girls have been through the camp, and many have gone on to pursue careers in STEM (science, technology, engineering and math) fields. A recent study of a group of former SciGirls showed that half went on to major in a STEM field, while most of the non-STEM majors assimilated STEM in their chosen fields, such as early childhood education and music therapy. "This program is so much more than a camp: It is a vital part of the lab and Tallahassee." "I have been part of this program since 2007 and even though my role has changed from researcher to teacher to co-director, the positive impact and overall joy this program brings to everyone involved is still palpable for me," said Roxanne Hughes, director of the MagLab’s Center for Integrating Research & Learning, SciGirls co-director and author of the study. "In two short weeks you see girls who had never met bond and form friendships based on their love of science. I get to see these young women grow and become amazing members of our local community and their college community. I get to work with teachers who tell me SciGirls is their favorite time of year because their energy and love of science is renewed. 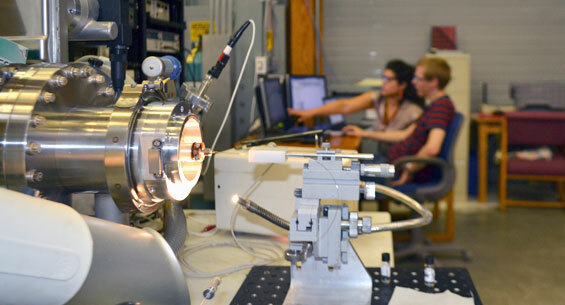 This program is so much more than a camp: It is a vital part of the lab and Tallahassee." We tracked down former SciGirls Lucy Toman and Stephanie Reynolds, both now pursing science careers, and talked to them about their SciGirls memories, how the camp influenced them, and their plans for the future. Lucy Toman liked SciGirls so much she attended twice. 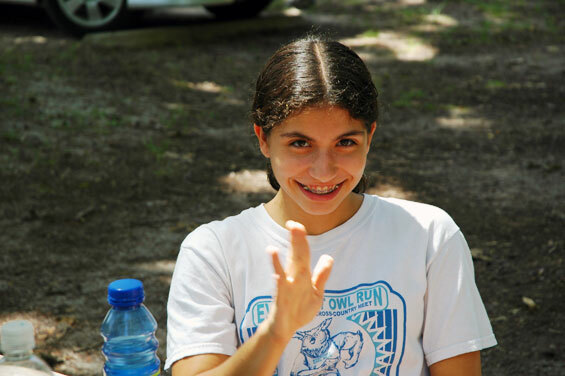 Now 20, she is studying industrial and systems engineering at the University of Florida. 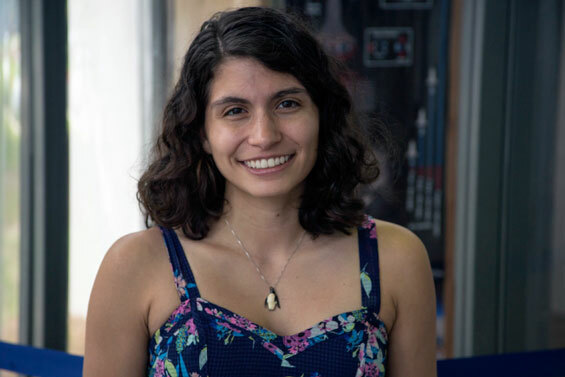 Inspired in part by her own SciGirls experiences, Toman is interning this summer with the Society of Women Engineers in Chicago, where she is working to get more girls involved in science. Were you interested in science prior to going to SciGirls Camp? Yes I was! I had a teacher in second grade who really inspired my love of science. Her classroom was lined with x-rays, including her dental work and a chest x-ray. Albert Einstein quotes and posters lined the walls, too, and I thought it was the coolest thing. We learned about fractions by summoning the principal into our classroom and then cutting his tie in thirds (unbeknownst to him) and explored different measurements by seeing how long the school hallway was. She made science exciting and interesting (and she was a woman! ), so it was clear to me that you didn't have to be a man to enjoy or excel at the topic. What are some of your favorite SciGirls memories? My favorite activity, by far, was the overnight stay at the Saturday-at-the-Sea location. I am a swimmer and I am always up for being near, or in, the water. I found it really cool to be able to go out on the boat and learn about the different marine habitats and the types of creatures that lived in those environments. I also found the cadaver excavation very fascinating. [Some SciGirls learn about forensic science by excavating a mock cadaver. -Ed.] I am a huge fan of crime shows, so to be able to do some of the things similar to what people do on TV was really interesting. I was also very surprised at how the TV shows were pretty accurate in their portrayal of how a crime scene would be processed. Being able to connect the topics we were learning about in camp to things that I enjoyed doing in my personal time was really helpful. "It sparks a curiosity that is hard to get rid of." What immediate impact did SciGirls have on you? Immediately after SciGirls you have such a rush to be involved in every aspect of science that you can. You want to do every other camp that relates to science and read every book there is about how you can change the world. It sparks a curiosity that is hard to get rid of. What long-term impact did SciGirls have on you? The camp instills a sense of thinking and exploring that you wouldn't get at a camp that stayed at the same place for the entire week and included both genders. I think it develops a level of understanding that women can (and will) do anything they want and that a gender gap should not stop them. I think that because I went to SciGirls and worked with other girls to discover some of the coolest experiments science has to offer, I have a better understanding of how women not only are, but need to be, involved in the STEM careers. By surrounding yourself with strong, smart women, you are filled with the "girl power” vibe and it's a vibe that everyone should have running through their body. In what ways did SciGirls prepare you for your higher education and training as a scientist? I think SciGirls helped prepare me to ask all kinds of questions. It sparked a curiosity that I don't think has left me (and I hope it never does!). I have found that in college, if you don't ask the questions, it is sometimes really hard to find the answer. There is sometimes a stigma related to asking questions because it means you don't have all the answers. But I guarantee that if you have a question in class, 95 percent of the other people in the class have the same exact question. You have to be comfortable with speaking out in front of others and making sure you are doing everything you can to learn all there is to learn. I think SciGirls helped me with that. What advice would you give to this year's SciGirls about pursuing science? If you have even the slightest inclination to do anything in the science field whatsoever, TRY IT! I think that sometimes the hardest thing to do in life is to take a chance or a risk and not know the outcome. Sometimes you have to look at life not as a science experiment, but as something that doesn't have a definitive answer. I think that by being women in STEM careers we are taking a chance. But I am so glad that I took that chance and I hope you will be too! What obstacles have you faced in your science education? It definitely is a little hard to be a minority in your own field. I have noticed it more so in college, and actually even more in this last year. I think that as the classes get more specific, it becomes more apparent that I am one of the only women in the room. But I think that you just have to be comfortable in your own skin and know that you have worked just as hard (if not harder) to be where you are and that you completely deserve to be there. Plus it's always nice when you are the only one in a room full of men that knows what's going on and how to attack the problem! What do you find most exciting about science? I really enjoy that most (if not all) questions in science have an answer. I think it is so rewarding to spend hours and hours and hours (sometimes even days) working on one problem to finally get an answer. It is a really great reward for all of your hard work that you put in to that one problem. And then the next day, you start on another problem! I still have about two and a half years left at UF to finish my industrial engineering degree. I plan to use my remaining summers in internships to decide what I want to do with my degree. I am very interested in humanitarian logistics, which is the study and organization of people and the efficiency of a human process. A good example would be disaster relief. The Red Cross has industrial engineers who come in after a disaster hits and determine the best way to allocate funds and volunteers. I am also interested in working in healthcare. There are many improvements that could be made in healthcare in order to streamline the process of patient care, while not losing the patient/doctor relationship. Stephanie Reynolds was a SciGirl the summer before she entered high school. Now 22, the newly minted California Institute of Technology grad will enter the Georgia Institute of Technology this fall to pursue a PhD in chemical engineering. What are your favorite SciGirls memories? I remember trying to burn dirt. We were supposed to come up with an experiment of some sort, and so we asked, "Does dirt burn?" I think our group was called, "the pyromaniacs." We gathered different kinds of dirt — clay and fine, grainy dirt — and then we just tried to light it on fire with matches. I don't think it worked very well, but we were trying for quite a while. I thought maybe because there was plant life or something in it that might burn. But it turns out there is not enough organic matter in dirt to actually set it on fire. "SciGirls just reassured me that I really enjoyed science and that it would be very suitable as a career." I guess it probably has more of an impact now than it did back then. My family, my friends, my teachers were all really supportive of me going into science. It was kind of just something fun to do over the summer at the time. But now I really appreciate the fact that women are not actually in science that much — I'm one of very few females going to grad school in my field. I realize. "Oh, that's why I had this camp back when I was in eighth grade." I've never really felt discouraged from being in science, but I know people who have. I think the message behind the camp is really cool. I miss being in an environment where they're, like, "Hey, women are good in science!" Was there anything special about going to an all-girls camp? At the time, I think I was more comfortable around girls than I was around guys. I think the all-girls environment let me be more relaxed and enjoy the camp more. One way that SciGirls helped train me as a scientist was through the notebook that we kept. I was given the impression that I should write everything down in my notebook and keep it as a record for the future. Ever since, I've kept a pretty good lab notebook documenting all of my experiments in the lab. Alongside that, SciGirls just reassured me that I really enjoyed science and that it would be very suitable as a career. I guess I figured that, as long as I enjoyed what I was doing, I would never have any trouble with higher education. What are some of the obstacles you have faced? I haven't really faced a lot of obstacles myself, but one of my friends, her parents actually told her she shouldn't get her PhD in chemical engineering because she's a girl. That's just not okay: I feel like anyone should do what they want as long as it's not hurting anyone. Also, my boyfriend's grandfather has told my boyfriend that he should get his PhD in chemical engineering also, because I shouldn't be more educated than my boyfriend is. I kind of just like doing science for the sake of science. I like doing research; eventually I want to go into research and development and learn new things and put new knowledge into the world. I just find it exciting to be at the very cusp of new technology. What would you like to say to this year's SciGirls? Not to give up. If you like science, go ahead and pursue it, no one is stopping you. There will be supporters along the way, there may be people who don't think you can do it. But if you set your mind to it, you can go into whatever field you want to. After grad school, I would like to go into research and development, maybe in the field of nanotechnology. There are a lot of options for R&D, though, so I'm not so sure about the exact field yet.